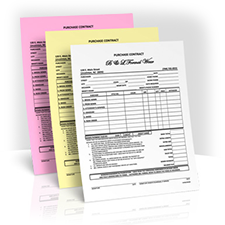 A variety of carbonless form options is available for custom printing. We print two, three and four part forms of various sizes. We also offer a large selection of custom value services to meet the needs of your company. Some of them include: consecutive numbering, single or double sided forms, glued forms or pads of forms, hole punching services, and shrink wrapping. You’ve got a great logo, so why not add it to your invoices and inventory sheets? What better way to complete your branding than by printing your own carbonless forms? Create the whole picture, fill in the blanks, and let your customers see that you’ve thought of everything, and never worry about duplicating invoice numbers again. Discover how easy filing paperwork can be when you are using your own, custom designed forms. If you have struggled with generic industry forms in the past, take this opportunity to focus on your needs. Carbonless forms benefit you as well as your clients. They can make time consuming tasks much easier when you have a clear form that keeps your name up front. Take this time to review the forms you use now and think about how to make them work better for you tomorrow. Order taking will go more smoothly and you can get your message across in easy-to-use forms that collect the data you need while reinforcing your slogan, your logo, and your message to your customers.